The Shyness and Social Anxiety Workbook for Teens offers a complete program based in cognitive behavioral therapy (CBT) and acceptance and commitment therapy (ACT) for helping teens break free from social anxiety and stop worrying about what others think. This book helps teens come to see that painful emotions, such as embarrassment, are inevitable and survivable. The comic-strip-style illustrations, exercises, and worksheets in this book address all aspects of social anxiety, from missing out on high school dances to going to job interviews. It also includes help for teens who have anxiety about blushing in public and speaking up in class. "This practical and straightforward book is highly recommended for any teen who worries too much about being judged by others. These tried-and-true strategies have been shown over and over to be among the most effective methods for reducing social anxiety. Every teen who struggles with shyness should read this book!" --Martin M. Antony, PhD, ABPP, chair of the department of psychology at Ryerson University and author of The Shyness and Social Anxiety Workbook "Good basic information on social anxiety as well as how to overcome it using cognitive behavioral therapy. The concise text and abundant illustrations make the book available, easy to grasp, and engaging for teens." --Edmund J. Bourne, PhD, author of The Anxiety and Phobia Workbook "Teens who follow the steps described in this book can overcome shyness and social anxiety and change their life path. Shannon's recommendations are based on the latest scientific findings, and are accompanied by delightful cartoons and drawings. An outstanding contribution." --Jacqueline B. 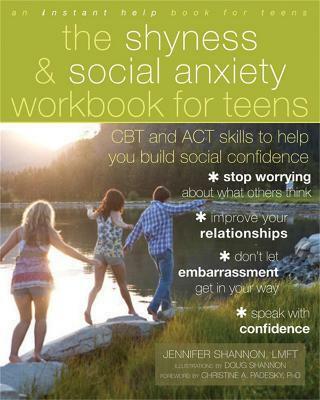 Persons, PhD, director of the San Francisco Bay Area Center for Cognitive Therapy and clinical professor in the department of psychology at the University of California, Berkeley "With The Shyness and Social Anxiety Workbook for Teens, Jennifer Shannon has hit a bull's-eye. Each page is fun, engaging, and filled with practical strategies to help teens break free from their social fears and worries. The book is certain to become an essential resource for teens, parents, and therapists. I highly recommend it." --Michael A. Tompkins, PhD, founding partner of the San Francisco Bay Area Center for Cognitive Therapy and author of My Anxious Mind: A Teen's Guide to Managing Anxiety and Panic "This book is superb! No longer will teens need to suffer with anxiety and be on the sidelines of life. Full of clear, effective, and engaging strategies, this workbook will show teens exactly what to do to overcome their fears and shyness and will reassure them that they are not alone. Truly, every teen struggles with these issues to varying degrees. All teenagers would benefit from reading this book." Jennifer Shannon, LMFT, is clinical director and cofounder of the Santa Rosa Center for Cognitive-Behavioral Therapy in Santa Rosa, CA. She is a diplomat of the Academy of Cognitive Therapy. Illustrator Doug Shannon is a freelance cartoonist and illustrator. His book, The Two Step, has been translated into several languages. He had a nationally syndicated cartoon strip called Claire and Weber from 1997 to 2000.